4641 63bPFI 1 Mk. Dark carmine red with scarce plate flaw \"extended Lane\", fresh colors and very well perforated, in perfect condition unused with original gumming. In of the rare colour, like here offered, are only a few copies became known! Photo expertize Jäschke-Lantelme BPP. 4642 63bPFII 1 Mk. Dark carmine red, the scarce colour with good plate flaw \"color line from right window in the first STOCK to to the right picture edge\", which only on field 7 occurred, wonderful fresh colors and very well perforated, insignificant slight trace of crease (probably manufactured), as far as in perfect condition mint never hinged there are only few examples this plate flaw in the good colour have become known! Photo expertize Zenker. 4643 63bSP 1 Mk. Dark carmine red, Muster stamp with overprint \"SPECIMEN\", fresh colors and in perfect condition mint never hinged photo expertize \"faultless mint never hinged condition\" Jäschke-Lantelme BPP. Michel 1200,- €. 4644 63bSP 1 Mk. 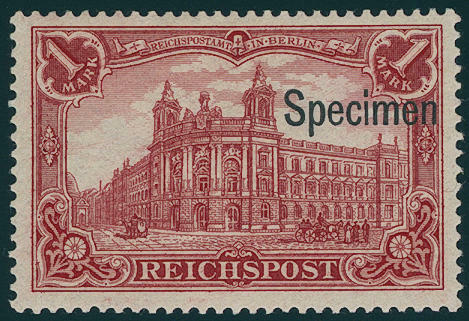 Dark carmine red, Muster stamp with overprint \"SPECIMEN\", fresh colors and in perfect condition unused with original gumming, expertized Jäschke BPP. Michel 600,- €. 4645 63bSPI 1 Mk. Brownish carmine with overprint \"SPECIMEN\", as well scarce plate flaw \"extended Lane\", wonderful fresh colors and very well perforated, from right margin of sheet, in perfect condition mint never hinged in perfect condition. In this combination extremely rare also in the Michel special catalogue unlisted! Photo expertize Jäschke BPP. Michel approximate 3000,- €. 4646 64IISP 2 Mk. 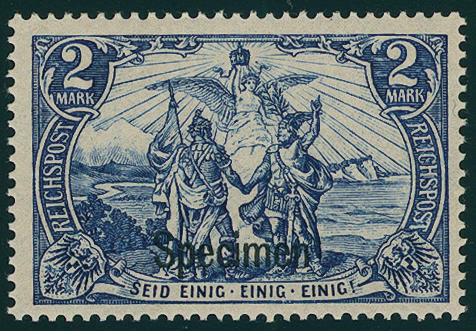 Black blue, type I, Muster stamp with overprint \"SPECIMEN\", fresh colors and very well perforated, in perfect condition unused with original gumming, photo expertize Jäschke BPP. Michel 800,- €. 4647 64ISP 2 Mk. 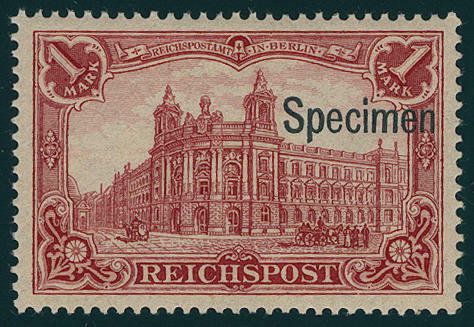 Reichspost, type I, scarce Muster stamp with overprint \"SPECIMEN\", wonderful fresh colors and very well perforated, in perfect condition mint never hinged, without any signs. Photo expertize \"faultless mint never hinged condition\" Jäschke BPP. 4648 64ISP 2 Mk. Black blue, type I, Muster stamp with overprint \"SPECIMEN\", wonderful fresh colors and very well perforated, in perfect condition unused with original gumming and tenuous trace of a hinge. Photo expertize \"faultless condition\" Jäschke-Lantelme BPP. 4649 65IISP 3 Mk. 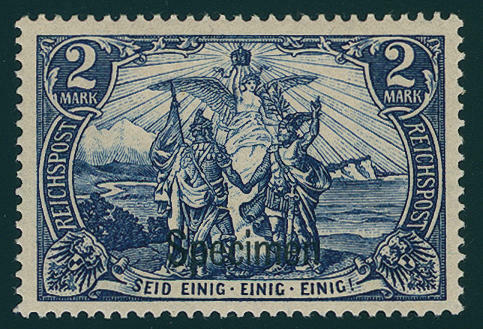 Reichspost, type II, with overprint \"SPECIMEN\", fresh colors and very well perforated, in perfect condition unused, expertized angel, Zenker. Michel 800,- €. 4650 65ISP 3 Mk. 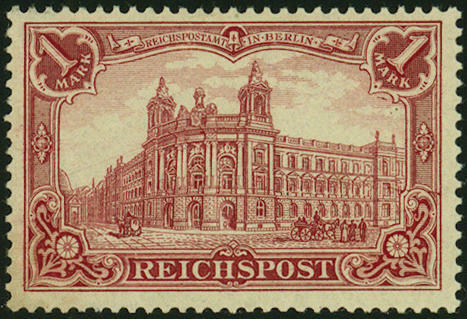 Reichspost, type I, Muster stamp with \"SPECIMEN\", wonderful deep colored, very well perforated, in perfect condition unused with original gumming and tenuous trace of a hinge. A very nice copy of this rare issue! Photo expertize \"faultless condition\" Jäschke-Lantelme BPP. 4651 ⊙ 66I 5 Mk. 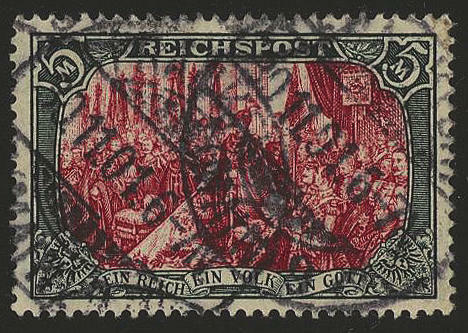 Reichspost, the scarce type I, fresh colors and very well perforated, neat cancelled \"FRANKFURT 30.11.01\". A nearly always missing issue in first-class quality! Photo expertize \"faultless condition\" Jäschke-Lantelme BPP. 4652 ⊙ 66I 5 Mk. 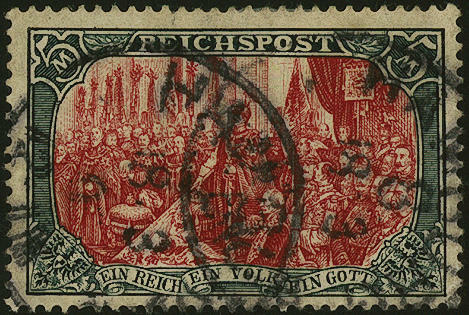 Reichspost, the very scarce type I, wonderful fresh colors and very well perforated, clean and neat cancelled \"FRANKFURT 17.4.01. \". 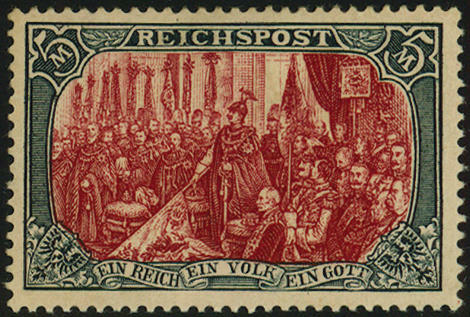 An outstanding quality this large German Reich rarity! Photo expertize \"faultless condition\" Jäschke-Lantelme BPP. 4653 ⊙ 66II/I 5 Mk. 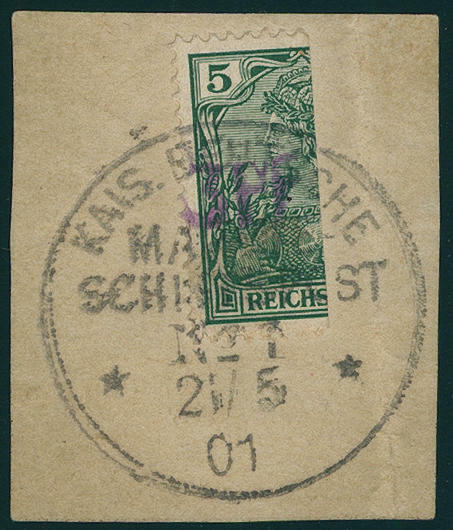 Reichspost with scarce plate flaw \"C IN REICHSPOST above broken\" (field 10), neat cancelled \"Hamburg 18.3.02\", an extraordinarily scarce issue, photo expertize Jäschke-Lantelme BPP. Michel 3000,- €. 4654 66II/II 5 Mk. 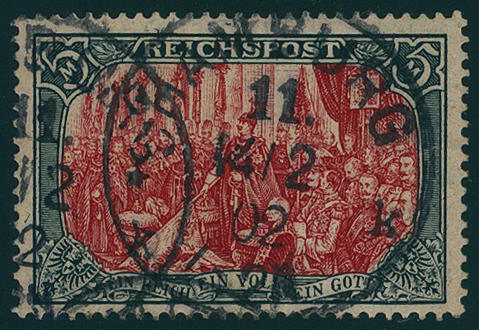 Reichspost, type II with very scarce plate flaw \"dot in the I of imperial post\", which only on field 20 occurred, fresh colors and very well perforated, in perfect condition mint never hinged in utterly perfect condition. Major rarity the empire issues also by Michel catalogue only noted without price. Photo expertize Jäschke-Lantelme BPP. 4655 66III 5 Mk. 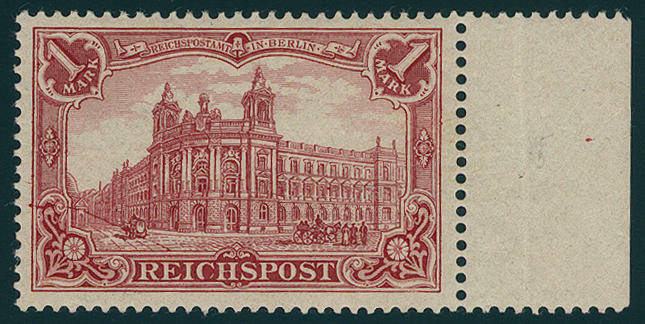 Reichspost, type III, fresh colors and very well perforated, in perfect condition unused with original gumming, expertized Jäschke BPP. Michel 480,- €. 4656 66IIISP 5 Mk. 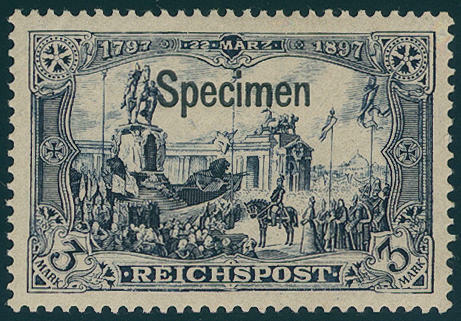 Reichspost, type III, Muster stamp with overprint \"SPECIMEN\", fresh colors and in perfect condition unused, expertized Ludin BPP. Michel 800,- €. 4657 66IISP 5 Mk. 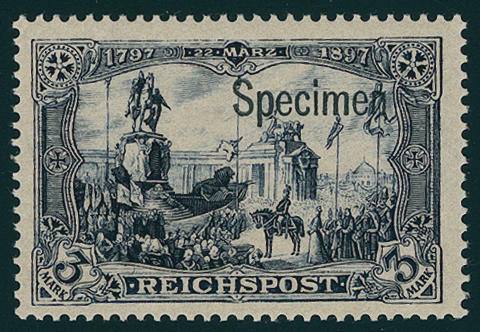 Reichspost, type II, Muster stamp with overprint \"SPECIMEN\", wonderful fresh colors, very well perforated, in perfect condition unused with original gumming, without any signs, photo expertize \"faultless condition\" Jäschke-Lantelme BPP. 4658 66IV 5 Mk. 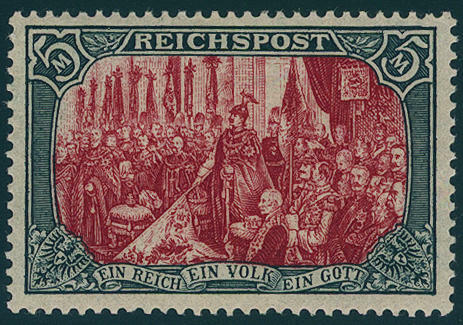 Reichspost, the scarce type IV, fresh colors and very well perforated, in perfect condition unused, expertized Jäschke-Lantelme BPP. Michel 800,- €. 4659 ⊙ 66Z 5 Mk. 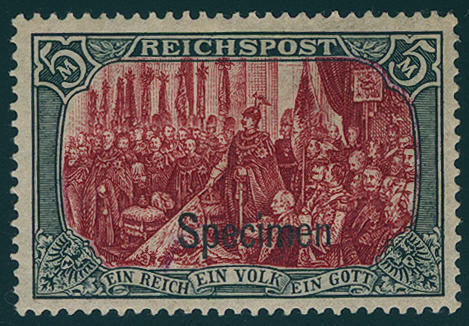 Reichspost green black / brownish carmine, the legendary so-called \"between type\" with framework in type I and centerpiece in type II, wonderful fresh colors and very well perforated, neat and clear used \"Hamburg 14.2.02. \" in utterly perfect condition. From of this issue are very few examples have become known. 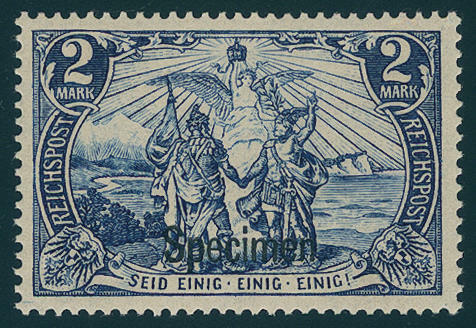 In this first class quality is a the most desirable rarities of the German empire. 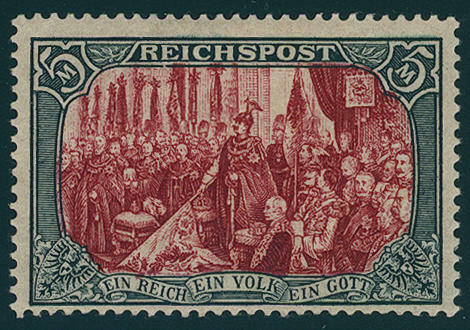 The most beautiful us known copy this large German Reich rarity, the in almost all collections is absent. Photo expertize \"fresh colors, very well perforated, faultless condition\" Jäschke-Lantelme BPP. 4660 ∆ AI 3 PF on 5 Pfg. 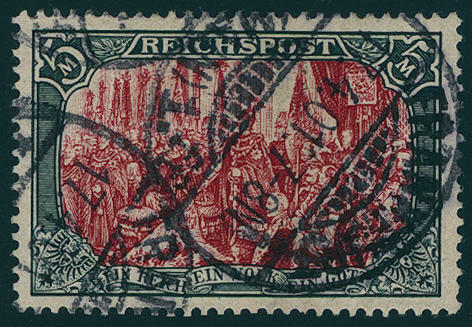 Germania, vertical bisects (left half), the famous Vineta Provisional arrangement, fresh colors and very well perforated on piece with especially clear overprint and full mounted single circle postmark \"KAIS. German navy shipÂ´s mail No. 1 21.5.01. \". 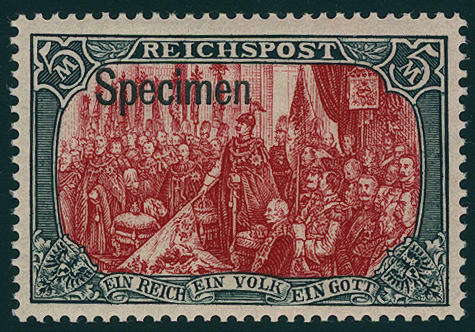 An outstanding quality this nearly always missing German Reich rarity with an edition from only 600 copies! Photo expertize \"the stamp is perfect quality\" Dr. Mozek BPP.